Why Is Israel Attacking Gaza? Shouldn’t More Journalists Press Israeli Officials About their Claims? Why is this war happening? 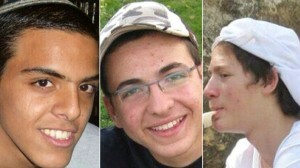 But did Hamas actually kill Naftali Fraenkel, Eyal Yifrach and Gilad Shaar? And if there’s no evidence that they did, shouldn’t more journalists be pressing Israeli officials about their claims? Israel accused Hamas of orchestrating the killing. Israeli troops cracked down hard on the militant group in the West Bank; Hamas responded by escalating rocket fire from Gaza into Israel. It is true that Hamas lauded the kidnappings, most likely as one way to strike a prisoner swap with Israel. The group did not claim responsibility for that action, though–which is precisely what one would have expected them to do. “The arrest campaign made by the Israeli occupation in the West Bank is targeted to break the backbone of Hamas and bring it down, but the Israelis will not succeed in achieving their goal,” Sami Abu Zuhri said. Fox News host Howard Kurtz (7/27/14) was, like Klein, sure about what happened: “There is no question that Hamas started the latest round of Mideast violence, first with the killing of three Israeli teenagers, and then by firing rockets indiscriminately at the Jewish state.” When it was noted onTwitter that there were still no evidence that Hamas was responsible (Mediaite,7/27/14), Kurtz tweeted: “My point on the three slain Israeli teenagers is that Hamas praised killings as a heroic act.” Which is, of course, not the same point at all. Lake’s piece does not substantiate the Israeli claims that Hamas bears responsibility. “Hamas is responsible, and Hamas will pay,” Netanyahu famously declared after the victims’ bodies were found (Washington Post,6/30/14). While the controversy over Rosenfeld’s statement and subsequent walkback is interesting, it does not change the fact that linking the crime to Hamas has always been a stretch (FAIR Blog, 7/2/14), since the suspects were not considered to be part of any formal Hamas cells. Journalism about the current violence is bound to focus on the death and destruction in Gaza. But there remains ample space to ask whether the war was launched to punish Hamas for something it had nothing to do with.